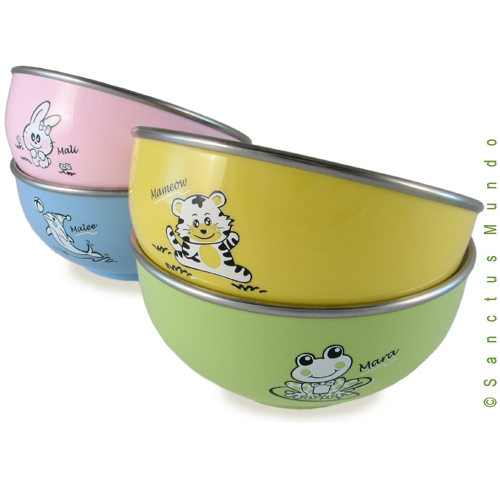 You are going to love these little cereal bowls for children. The interior is made of high quality, food grade 304 stainless steel and the outside is made of stable and durable polypropylene plastic (#5). The bowls come in our own eco-friendly designer box. These bowls are not microwave safe and are not dishwasher safe. BPA free. I love the items you offer and often see useful things I would love to order at the advertised bargain price. However each time I go through the checkout process, your shipping costs end up pricing the item out of the range that I'm willing to pay. Often with your high shipping, it ends up being that I can find the exact same item elsewhere at regular prices that end up costing less simply because of your added high shipping costs. I subscribe to many daily deal type sites and I believe your shipping costs rank among the highest. Is there any way you might be able to offer flat-rate or reduced shipping? I can't imagine I'm the first to come across this dilemma. Hi! We charge actual shipping costs that are direct from the USPS. On this deal, it weighed a little over a pound. That cuts out first class mail, and only leaves Parcel or Priority. If we put this item in a flat rate box, you would be paying for a medium flate rate box which is $10.95. Again, we only charge actual shipping on all items. I don't think you get what the previous poster is saying. It not about the shipping for this particular item. Your losing business because of your shipping rates. I'm not sure how other companies are able to offer lower shipping on a consistent basis,but you should look into it because it's hindering your business! Just wondering how I can buy these bowls please ?